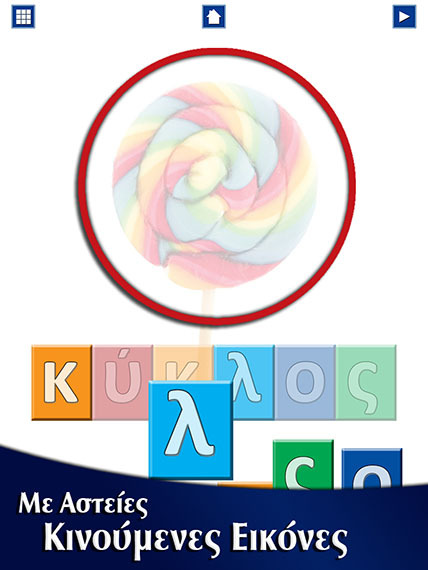 Welcome to "First Greek Words Pro", the professional edition of the first and ultimate universal educational application (also enhanced for the iPhone 5) that helps children learn letters sounds (phonics), letter names, how these form words, and how to spell, all in Greek! 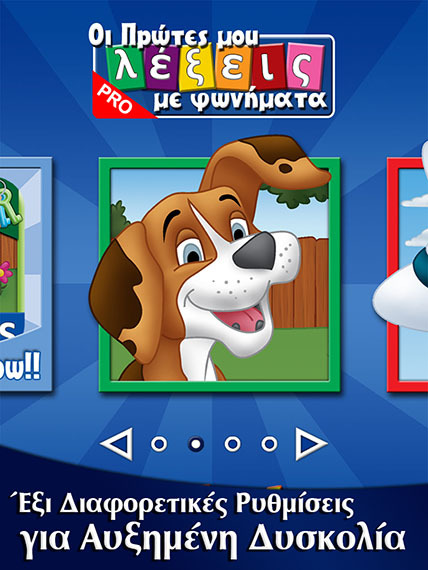 "First Greek Words Pro" includes 80 words in three categories Animals, Vehicles and Shapes and Colors. The three different hint alternatives (color hints, letter hints and color and letter hints) combined with five more settings, will challenge your child and helps you fine tune the level of difficult. The unique interface, featuring a list of thumbnails, allows your child to explore all words and will offer endless hours of fun and education. Featured by Apple on What's Hot for the iPhone in two categories Games/Educational and Games/Kids on the US, UK, Canadian, Australian and Greek App Stores!!! «Οι Πρώτες μου Λέξεις στα Ελληνικά Pro» είναι η πρώτη και μοναδική Universal εκπαιδευτική εφαρμογή (ειδικά σχεδιασμένη για το iPhone 5) που βοηθάει τα παιδιά να μάθουν τους ήχους των γραμμάτων (φωνήματα), τα ονόματά των γραμμάτων, πως αυτά σχηματίζουν λέξεις, και την ορθογραφία τους στα Ελληνικά!!! 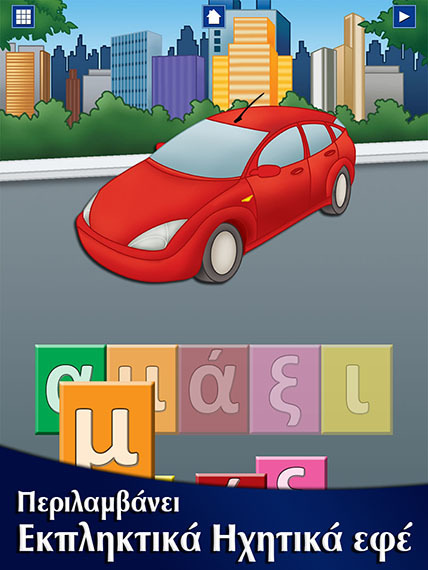 ● Learn letter sounds (phonics), letter names, words and how to spell in Greek. ● Six different settings for increased difficulty. ● Greek interface available (device international setting must be set to Greek). ● Universal app also enhanced for iPhone 5. ● Special alert in iPhone reminding you to switch to Flight Mode.